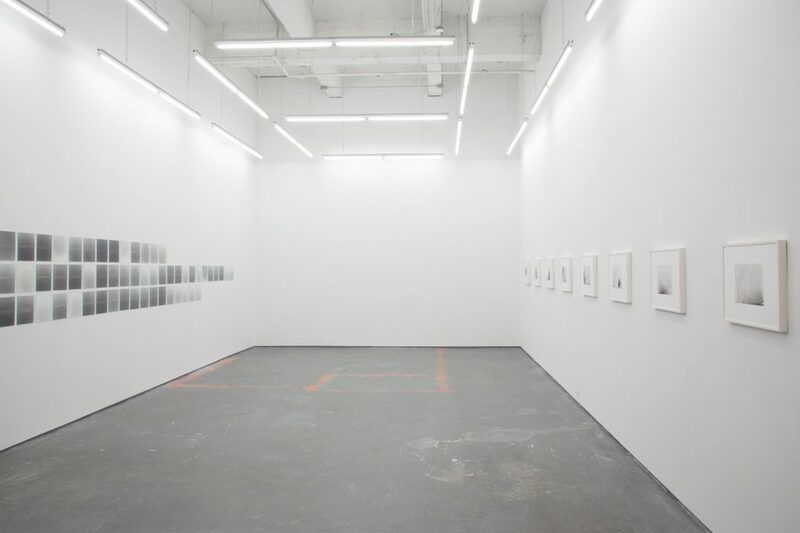 Katherine Hubbard’s solo exhibition, water is what holds the heat, brings together two photographic darkroom projects that independently work to explore analogue black and white photography. 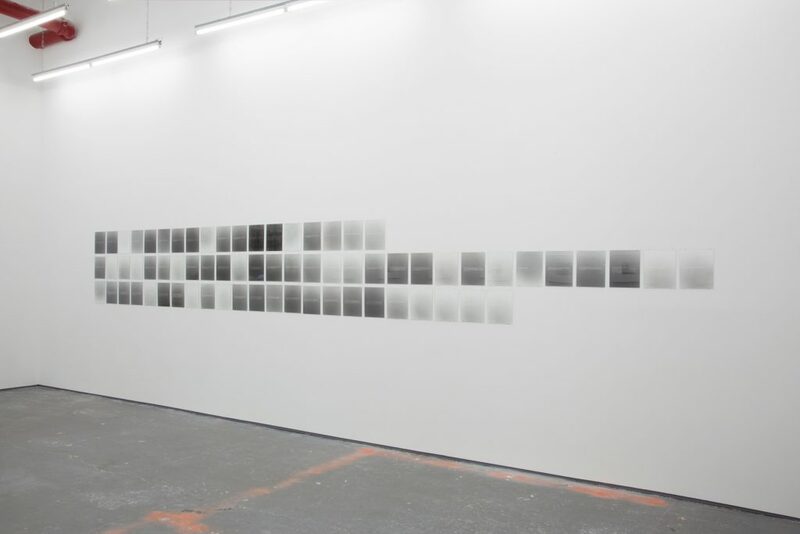 Hubbard views the positioning of the body and film plane within various performative environments as having an essential relationship to the reception of photographs, engaging the medium as an expanded sensorial experience. These two bodies of work emphasize how Hubbard’s performance work and use of language reveal a clearer understanding of the medium of photography through what is not visible beyond the registration of surface. In Hubbard’s new series, Bring your own lights… one of a kind photogram images are considered documentation of her performance by the same name that occurred in the exhibition space at The Kitchen on October 14th and 21st, 2016. Transforming the gallery into a darkroom, Hubbard turned the theatrical spotlights into red darkroom “safelights”. 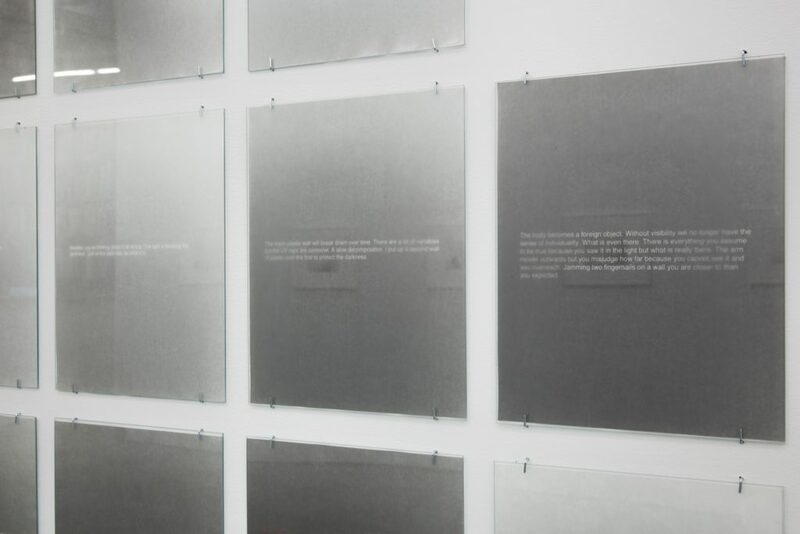 Throughout the hour-long performance, she read a 70-page text that addresses the darkroom as a physical space and as a metaphor for formulations of darkness, placing each page of text, one at a time, over a piece of silver gelatin photographic paper and using a flashlight to illuminate the text as she read aloud. The light exposed the photographic paper through the page of text in accordance with the length of time it took to read, each latent image thus becoming an inversion. The final, 70-page photogram work is being shown for the first time. Hubbard’s 8 silver gelatin prints from her series, Bend the rays more sharply… exposes large format negatives through ice. In specially designed boxes, negatives were placed in brackish water collected from Red Hook, Brooklyn. Each negative was then individually positioned in a box at every ten-degree angle between zero and ninety. After the water had frozen, the negatives, now embedded in ice, were exposed from a stationary projection of light above. The ice then became a lens through which the negative was exposed, but not a lens crafted with a determined focal point or capacity for repetition. The rotation of the negative from zero to ninety degrees in relation to the light source altered the temporary focal capacities of the ice lens, as the ice “images” itself. Katherine Hubbard (USA, b. 1981) received her BFA at Parsons School of Design in 2004 and her MFA in 2010 from the Milton Avery Graduate School of the Arts at Bard College. 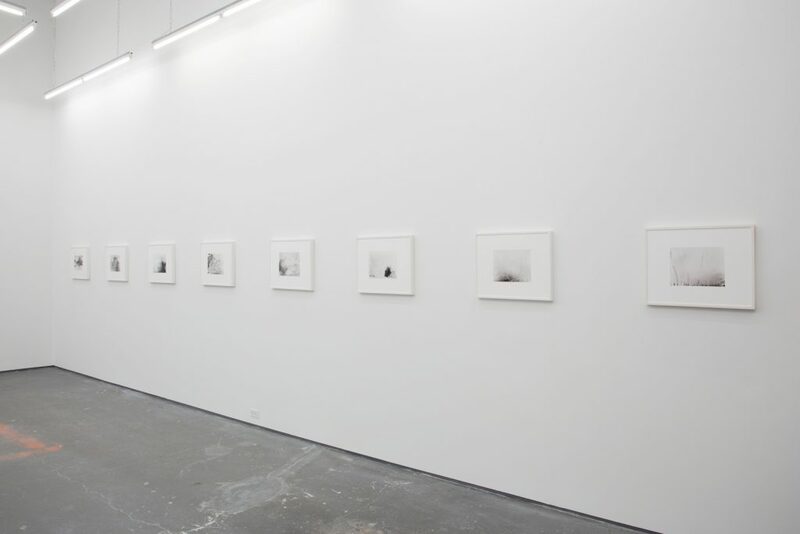 Hubbard has held solo exhibitions at The Kitchen, NY and Company Gallery, NY. Her solo and collaborative performances have been presented at MoMA PS1, NY; Judd Foundation, NY; Participant Inc.,NY; c.off, Stockholm, Sweden; Whitney Museum of American Art, NY; Brooklyn Museum, NY and the Metropolitan Museum of Art, NY. Hubbard currently lives and works in Brooklyn, NY.